For two years I’ve been consistent about blogging in “A Words Worth,” but the last two weeks I’ve been away from my desk, as editors of newspapers often announce when they go on the road. I’ve been on two mercy missions: 1) a return trip to New Iberia for my oldest daughter’s surgery, and 2) a quick trip circling back to Florida where my friend Vickie’s mother, 90, has been ill. Actually, the trips afforded another opportunity to experience civility in action, which I had lamented about being a lost art in two former blogs. Again, the happening occurred in Mississippi, a state that I have concluded is the birthplace of authentic courtesy. The following morning at breakfast, the manager came over to my table and sat down. “How were the cookies?” he asked. “What cookies,” I asked. His face fell. “You didn’t get them?” I could tell he was disturbed. “But you wanted them,” he exclaimed. He began to apologize and suddenly remembered that when they were looking through room numbers to find my room, another Moore was listed as a guest. I laughed. “So someone else was surprised with a bag of cookies,” I said. The manager laughed with me and apologized again for the mistake. He spent ten minutes at my table, and we enjoyed good exchange about Hattiesburg where my mother once attended Mississippi Women’s College before the college became defunct. As I walked toward my room, I heard someone call my name, and one of the breakfast service women ran up to me. “You need to wait fifteen minutes before you leave,” she said. We have something at the desk for you.” I beamed at her. You guessed it—I picked up eight, freshly-baked chocolate chip cookies on a paper plate, wrapped and ready to go. As I scurried down the sidewalk with my package, the manager opened a side door, stepped out and shook my hand, and wished me well. My friend with whom I traveled calls this the “Chocolate Cookie Caper” and advised me to blog about this happening to record another act of civility. And, no, I didn’t need those cookies, but they advertised the willingness of the employees at this hotel to serve people well. As I said before, I’ve begun to believe that civility and courtesy are still alive, and they thrive in the heart of the South in old Mississippi. Yesterday, the sun came to The Mountain here at Sewanee, and I spent the day outdoors raking twigs in the front yard, which is really a sea of moss and dead grass. 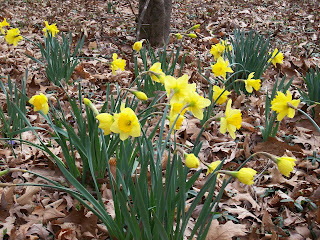 While raking, I spied one lonely yellow daffodil in the woods adjoining the yard and walked over for a closer look–a cluster of flowers bore buds that were near bursting through, and I anticipated them opening in a week or so. However, I looked out of my study window this morning and saw the happy faces on at least ten plants. Later, we went over for a visit with our friend, Anne Boykin, and saw her front yard thick with daffodils that reflected the welcome sunlight. The sight of these wonderful spring flowers brought to mind the poet William Wordsworth ’s lines: “I wandered lonely as a cloud/that floats on high o’er vales and hills/when all at once I saw a crowd,/ a host of golden daffodils.” These golden blooms announce the coming of Easter, a time of resurrection and rebirth in the Christian world, and in many places in the U.S., daffodil festivals are held to celebrate the advent of spring. Daffodil is a common English name derived from the botanical genus name Narcissus. The ancient Greeks created a legend about this flower in which a vain youth died after he became so enamored of his own reflection that he couldn’t leave the pool and died of starvation and thirst at the edge of the water. The gods turned his remains into the lovely flower, and that tale has persisted since antiquity. The legend became a nomenclature in contemporary psychology; a person who is labeled narcissistic is one who epitomizes self-absorption and self-centeredness. When I see the glorious daffodils every spring, I try to discount the legends and nomenclatures associated with these plants. We’re warned to beware of the toxicity in daffodil leaves, as all varieties of Narcissus contain the alkaloid poison, lycorine. Last year, school children in Suffolk England became sick after they included a daffodil bulb for zest in a soup they were making in cooking class. The bulb resembles an onion and could be confused with those edible bulbs. However, good press about daffodils tout that Japanese medical practitioners once treated wounds with the narcissus bulb and wheat flour paste. Residents of China with a plot of daffodils that blooms during the Chinese New Year can expect wealth and good fortune throughout the coming year. I prefer the Chinese legend to the Greek version regarding Narcissus. To a poet, the cluster of daffodils in the yard provides inspiration, and I’m with Wordsworth in extolling their trumpeting beauty, despite the bad press and legends attributed to this spring flower. One of the events I will miss, now that I’m no longer in New Iberia, is the second Evening of Poetry and Performance on April 30 at the A&E Gallery on St. Peter Street. My friend Darrell Bourque, with whom I read poetry at the First Poetry and Performance Evening, will introduce Ava Leavell Haymon who teaches poetry writing in Baton Rouge and who is also director of a writer’s retreat in Santa Fe, New Mexico. 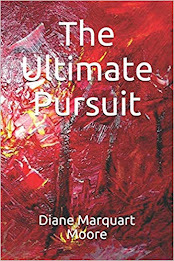 This poet’s third volume of poetry is entitled WHY THE HOUSE IS MADE OF GINGERBREAD and has been endorsed by Claudia Emerson, Pulitzer Prize winner for Poetry in 2006. Emerson describes Haymon’s new book as one that has an “insistent version of magical intensity and power.” I know that the performance will be one that I will regret not having stayed in Teche country to hear. Claudia Emerson, Haymon’s endorser, has read at the Sewanee Writers’ Conference for several years and has been published by the LSU Press in Baton Rouge, Louisiana. In 2008 she read many of her poems from LATE WIFE and received considerable applause for her rendition of “Pitching Horseshoes,” a poignant work about the demise of a marriage in which the husband spends his evenings pitching horseshoes while the wife “alone, washes up the dishes/or watered the garden to the thudding/sound of the horseshoes in the pit...” Emerson is professor of English at the University of Mary Washington in Fredericksburg, Virginia, a spot where some of my Greenlaw kinfolk live. She also holds the Arrington Distinguished Chair of Poetry and is Poet Laureate of Virginia. The conclusion to Emerson’s reading was a surprise act in which her second spouse, Kent Ippolito, a musician who plays bluegrass, blues and rock, went onstage with a guitar slung around his neck and began playing for Emerson. She sang one of her poems that reflected the anger she felt about the divorce involving her first husband, the horseshoe pitcher. The husband/wife act brought down the house, and by the time I got to the University bookstore the following day, every copy of Emerson’s LATE WIFE book of poetry had been sold. If A&E Gallery continues to sponsor poets, perhaps Emerson and other distinguished poets will appear on the venue. Brava Paul Schexnayder for providing the space for noteworthy artists and writers to present and perform their art. New Iberians who attend the readings also appreciate our Louisiana poet laureate, Darrell Bourque, who acts as an emissary for poet luminaries to perform in “The Berry,” otherwise known as New Iberia. So goes the early morning visions of an aging woman who loves crows–to the chagrin of many people who think that crows are public nuisances–and who also loves civility, the absence of which causes her to attribute this lost art to the birds of the air. Civic virtue has been around for a long time, dating back to ancient Greece when Socrates and Plato declared civility was a matter of political duty. The Ten Commandments contain most of the rules for civility and were delivered to bring about actions that would transform the world so that citizens could live together as respectful, caring people. For me, civility incorporates good manners, courteous behavior, listening to other people in an attempt to reach agreement, and it includes people working and making contributions to society. Incivility covers a list of rude behaviors like disrespect for elders, public displays of temper, and threats to other citizens. During the 40’s when I was growing up in Baton Rouge, Louisiana, the principal of my elementary school a woman named Mrs. Peters who had dyed red hair, walked the halls with a wooden paddle under her arm, and taught good manners and the principles of civic virtue. The paddle was a threat to those who bullied, vandalized, sassed teachers, and generally wreaked havoc in the classroom and the schoolyard. Later, I was taught civic virtue in the Girl Scouts, an organization with goals to foster good behavior in women who learned to consider the needs of others and to contribute to the larger community. Having said all of that, I have to report an incident of civility that happened as we were traveling toward Tennessee a few days ago. We had started out with a new set of tires on my Honda Hybrid–tires reputed to be of good quality and that were balanced before we took to the road–tires that were delivered with the admonition that good tires and proper balancing are a matter of safety. This advice was delivered by the manager of a tire supply and service company in New Iberia. By the time we reached Baton Rouge, my teeth were chattering from vibrations of the car, and as we drove further, they became stronger. I consulted the Honda handbook and found that we were probably traveling on a ride of unbalanced tires. I won’t repeat what I said about the preachy tire provider. When we reached Meridian, Mississippi, I noticed a tire company on the left hand side of the highway where twenty or so big 18-wheelers were parked. There were no cars around. However, we swerved onto the service road and pulled into the crowded lot. We entered a small business office where brawny truckers stood before the counter and asked if someone could just take a look at the tires. A manager with a Mississippi drawl as thick as my own told us he’d have someone check them out. We were fairly travel-worn and probably looked as though we had been behind the wheel of an eighteen wheeler, and the manager kept us waiting about ten minutes before he directed a worker to check out the Honda. The car was stacked to the ceiling in the back seat and the floor was also filled with boxes of manuscripts and papers, so the front seat was pushed forward until the driver was almost affixed to the steering wheel. The stout man checking the tires couldn’t get behind the steering wheel and came into the office, apologizing for his bulkiness. Vickie went out and steered the Honda into the space designated for replacing and balancing tires, reassuring the worker that we were transporting too much stuff. Inside the business office, I spied a vending machine with moon pies, a dessert I tasted back in the 50’s and declared inedible, but we scurried around for change to purchase a banana double decker moon pie (a cookie that really is long on sweetness). When I took the first bite, the manager, who was sitting behind the service counter, said, “You need an RC to go with that.” “Yes, I know the formula. Actually, we’re headed for the place where these are made,” I told him. So began a conversation about the Moon Pie Festival in Bellbuckle, Tennessee, about mutual travels, and his upcoming twenty-fifth wedding anniversary. Before the conversation ended, I had lapsed into my Franklinton, Louisiana drawl (derived from my Mississippi great-grandparents). When we finally fell silent after twenty minutes of robust conversation, the worker came in and declared that every tire had been balanced improperly wherever we had bought them. We were temporarily dismayed until the manager declared “He says they’re fixed now. You’re ready to roll.” “How much?” Vickie asked. “No charge,” the manager said emphatically. “Have a safe trip.” We thanked him in southern dialect and drove on. The Honda moved along without vibration and when we reached the Tennessee line, it climbed The Mountain smoothly. Now what would that service cost at most tire businesses, especially a business that didn’t cater to cars? Not “no charge,” that’s for sure. Perhaps the manager was showing respect for my white hair; perhaps he empathized with two women driving out of state who showed up tired and a little doubtful that they’d be helped. The point is that he conversed with us, listened to our problem, tried to provide assistance, submitted to a need above “making a buck,” and made a useful contribution. That was civility in action. No more rants about civility for me for awhile anyway. And Meridian, Mississippi is on my list of those possessing the virtue of civility. Yesterday, I went into A&E Gallery to purchase one of Paul Schexnayder’s prints and met another New Iberia artist of note who exhibits in, and helps manage, the gallery. I first heard of Kate Ferry in the 90’s when Morris Raphael commissioned her to do illustrations for MARIA, GODDESS OF THE TECHE, a fantasy about a mermaid who lives in the Bayou Teche. 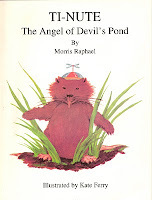 A few years later, Kate also illustrated Morris’s TI-NUTE, THE ANGEL OF DEVIL’S POND, a story about one of the numerous nutria that abound in Teche country. Another Teche country author and photographer, Greg Guirard, commissioned Kate to illustrate THE LAND OF DEAD GIANTS which has as its setting the Atchafalaya Basin. Kate, a free-lance graphic designer/illustrator, graduated from Mt. Carmel here in New Iberia and completed formal art training at the Art Institute of Houston. She has studied with Elemore Morgan, Sara Parker, and Diana Kan and participated in an Illustrators Workshop in St. Maarten, an island in the Caribbean. When the Acadiana Symphony in Lafayette sponsored a Painted Instrument Project, she was one of 25 artists who painted instruments as part of the Symphony’s 25th anniversary celebration. Inspired by Django Reinhart, a gypsy and jazz guitar artist, Kate painted a guitar in acrylics with beads, fabrics, and leather strips. Kate says the guitars will be auctioned off this spring and are also for sale. Kate works in watercolor and mixed media and likes to paint on “beat-up pieces of wood.” She has created many carnival masks and faces and has done linoleum block prints of masks/faces, focusing on rough textures and layering of colors. She says she likes to produce work that appears to have been exposed to the elements, similar to advertising and signs on the side of a building or barn. Her “canvas” also extends to painting bowling pins, rocking chairs, and benches. In 2009, Kate painted the poster for Festival Internationale held in Lafayette each year --three women , representing morning, noon and nighttime activities, play music and dance in the painting. 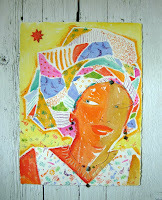 Recently, she has begun “3-D work” with paper-mache’, artistic pieces constructed of paper and other materials. This three-dimensional work will be exhibited at A&E Gallery during the gallery’s first year anniversary celebration on April 11. A&E Gallery is the site of the poetry reading where Darrell Bourque, Bonny McDonald, and I performed on January 29 and has become the meeting place of artists and writers in New Iberia, thanks to the sponsorship of Paul Schexnayder. When I was doing research for my most recent book, THE MAINE EVENT, (which is yet at the printers but coming soon) I came across intriguing weather information that I felt would enhance a conversation between the heroine and her spouse. The information concerned an eccentric psychologist, Wilheim Reich , who was born in Austria and studied under the renowned psychotherapist Sigmund Freud . Reich disagreed with Freud’s methods of psychoanalysis and moved to Rangeley, Maine to pursue research regarding orgone energy. He thought orgone was a massless, omnipresent substance that was closely associated with living energy, and he conducted experiments which he claimed proved his theory that this energy force controlled the universe. He invented special orgone accumulators, devices that he touted could capture and harness energy and affect weather by altering levels of atmospheric orgone. Reich created the orgone box, which he said could act as a cloudbuster, stimulating rainfall. I mentioned the box in my novel, THE MAINE EVENT, in part of a conversation about a Maine storm. I’ll include the excerpt from this novel following this introduction to the orgone theory. In 1954, Reich was jailed because he defied the U.S. Food and Drug Administration’s injunction to cease making the orgone boxes and shipping them across state lines. The FDA then destroyed Reich’s books about orgone, along with research information and devices. Reich died in a federal penitentiary and was buried on the grounds of Orgonon, his estate in Rangeley, Maine. I guess my interest in the orgone boxes centers more on how to stop rain, snow, storms, rather than on Reich’s interest in stimulating rainfall. By the way, the famous author, J. D. Salinger, who died recently, would sometimes sit in an orgone box as part of his homeopathic health regime. Orgone hasn’t been validated by Science, although research into the subject of orgone therapy was still being done as late as 2007; however, use of orgone equipment is rare. “Hope that Reich isn’t experimenting with the weather again,” Jim said. “What on earth are you talking about? It was obvious Jim wanted to divert me from talking about Birdie’s death. I knew that he suspected I’d go hunting the killer next. I laughed, at first almost a chuckle, then hysterically, as the vision of a wild-haired scientist manipulating a weather machine surfaced. Annoyed, Jim ignored my laughter and went into the bedroom to change into civvies. I guess that my skepticism about orgones was reflected in the short conversation about them in THE MAINE EVENT, but there are “believers” in Reich’s theory, and researchers at the National Center for Complementary and Alternative Medicine regard orgone as a type of “putative energy.” Well, it'd be nice if we had a device that could dispel some of the gray days we’ve endured this harsh winter.